Pharmacogenetic studies on the antipsychotic treatment. Current status and perspectives. Cortés A, Pérez V, Martín A, Barros F, Gesteira A, Baiget M, Carracedo A. Actas Esp Psiquiatr. 2010. Association study of the serotoninergic system in migraine in the Spanish population. Corominas R, Sobrido MJ, Ribasés M, Cuenca-León E, Blanco-Arias P, Narberhaus B, Roig M, Leira R, López-González J, Macaya A, Cormand B. Am J Med Genet B. 2010. Nucleotide variation in central nervous system genes among male suicide attempters. Baca-Garcia E, Vaquero-Lorenzo C, Perez-Rodriguez MM, Gratacòs M, Bayés M, Santiago-Mozos R, Leiva-Murillo JM, de Prado-Cumplido M, Artes-Rodriguez A, Ceverino A, Diaz-Sastre C, Fernandez-Navarro P, Costas J, Fernandez-Piqueras J, Diaz-Hernandez M, de Leon J, Baca-Baldomero E, Saiz-Ruiz J, Mann JJ, Parsey RV, Carracedo A, Estivill X, Oquendo MA. Am J Med Genet B. 2010. Identification of a novel MYBPC3 gene variant in a patient with hypertrophic cardiomyopathy. Brion M, Allegue C, Gil R, Blanco-Verea A, Carracedo A, Pagannone E, Evangelista A, Di Castro S, Marchitti S, Stanzione R, Volpe M, Rubattu S. Ann Clin Lab Sci. 2010. In silico directed chemical probing of the adenosine receptor family. Areias FM, Brea J, Gregori-Puigjané E, Zaki ME, Carvalho MA, Domínguez E, Gutiérrez-de-Terán H, Proença MF, Loza MI, Mestres J. Bioorg Med Chem. 2010. Exfoliative cytology for diagnosing oral cancer. Pérez-Sayáns M, Somoza-Martín JM, Barros-Angueira F, Reboiras-López MD, Gándara-Vila P, Gándara Rey JM, García-García A. Biotech Histochem. 2010. COGENT (COlorectal cancer GENeTics): an international consortium to study the role of polymorphic variation on the risk of colorectal cancer. Tomlinson IP, Dunlop M, Campbell H, Zanke B, Gallinger S, Hudson T, Koessler T, Pharoah PD, Niittymäki I, Tuupanen S, Aaltonen LA, Hemminki K, Lindblom A, Försti A, Sieber O, Lipton L, van Wezel T, Morreau H, Wijnen JT, Devilee P, Matsuda K, Nakamura Y, Castellví-Bel S, Ruiz-Ponte C, Castells A, Carracedo A, Ho JW, Sham P, Hofstra RM, Vodicka P, Brenner H, Hampe J, Schafmayer C, Tepel J, Schreiber S, Völzke H, Lerch MM, Schmidt CA, Buch S, Moreno V, Villanueva CM, Peterlongo P, Radice P, Echeverry MM, Velez A, Carvajal-Carmona L, Scott R, Penegar S, Broderick P, Tenesa A, Houlston RS. Br J Cancer. 2010 Jan 19;102(2):447-54. doi: 10.1038/sj.bjc.6605338. Epub 2009 Nov 17. Verification that common variation at 2q37.1, 6p25.3, 11q24.1, 15q23, and 19q13.32 influences chronic lymphocytic leukaemia risk. Crowther-Swanepoel D, Mansouri M, Enjuanes A, Vega A, Smedby KE, Ruiz-Ponte C, Jurlander J, Juliusson G, Montserrat E, Catovsky D, Campo E, Carracedo A, Rosenquist R, Houlston RS. Brit J Haematol. 2010 Aug;150(4):473-9. doi: 10.1111/j.1365-2141.2010.08270.x. Epub 2010 Jun 10. Phe369(738) at human 5-HT(7) receptors confers interspecies selectivity to antagonists and partial agonists. Varin T, Gutiérrez-de-Terán H, Castro M, Brea J, Fabis F, Dauphin F, Aqvist J, Lepailleur A, Perez P, Burgueño J, Vela JM, Loza MI, Rodrigo J. Brit J Pharmacol. 2010 Mar;159(5):1069-81. doi: 10.1111/j.1476-5381.2009.00481.x. Epub 2009 Nov 18. Parity and the risk of breast and ovarian cancer in BRCA1 and BRCA2 mutation carriers. Milne RL, Osorio A, Ramón y Cajal T, Baiget M, Lasa A, Diaz-Rubio E, de la Hoya M, Caldés T, Teulé A, Lázaro C, Blanco I, Balmaña J, Sánchez-Ollé G, Vega A, Blanco A, Chirivella I, Esteban Cardeñosa E, Durán M, Velasco E, Martínez de Dueñas E, Tejada MI, Miramar MD, Calvo MT, Guillén-Ponce C, Salazar R, San Román C, Urioste M, Benítez J. Breast Cancer Res Treat. 2010 Jan;119(1):221-32. doi: 10.1007/s10549-009-0394-1. Epub 2009 Apr 16. Measurement of ATP6V1C1 expression in brush cytology samples as a diagnostic and prognostic marker in oral squamous cell carcinoma. Pérez-Sayáns M, Reboiras-López MD, Somoza-Martín JM, Barros-Angueira F, Diz PG, Rey JM, García-García A. Cancer Biol Ther. 2010. Colorectal cancer susceptibility quantitative trait loci in mice as a novel approach to detect low-penetrance variants in humans: a two-stage case-control study. Fernández-Rozadilla C, Tarrío R, Clofent J, de Castro L, Brea-Fernández A, Bessa X, Abulí A, Andreu M, Jover R, Xicola R, Llor X, Castells A, Castellví-Bel S, Carracedo A, Ruiz-Ponte C; Gastrointestinal Oncology Group of the Spanish Gastroenterological Association. Cancer Epidemiol Biomarkers Prev. 2010 Feb;19(2):619-23. doi: 10.1158/1055-9965.EPI-09-1175. Multidrug resistance in oral squamous cell carcinoma: The role of vacuolar ATPases. Pérez-Sayáns M, Somoza-Martín JM, Barros-Angueira F, Diz PG, Rey JM, García-García A. Cancer Lett. 2010 Sep 28;295(2):135-43. doi: 10.1016/j.canlet.2010.03.019. Epub 2010 Apr 24. Crystal structure of thioflavin-T and its binding to amyloid fibrils: insights at the molecular level. Rodríguez-Rodríguez C, Rimola A, Rodríguez-Santiago L, Ugliengo P, Alvarez-Larena A, Gutiérrez-de-Terán H, Sodupe M, González-Duarte P. Chem Commun. 2010 Feb 21;46(7):1156-8. doi: 10.1039/b912396b. Epub 2010 Jan 4. Beyond BRCA1 and BRCA2 wild-type breast and/or ovarian cancer families: germline mutations in TP53 and PTEN. Blanco A, Graña B, Fachal L, Santamariña M, Cameselle-Teijeiro J, Ruíz-Ponte C, Carracedo A, Vega A. Clin Genet. 2010. A new approach to long QT syndrome mutation detection by Sequenom MassARRAY system. Allegue C, Gil R, Sanchez-Diz P, Torres M, Quintela I, Carracedo A, Brión M. Electrophoresis. 2010. Linking the sub-Saharan and West Eurasian gene pools: maternal and paternal heritage of the Tuareg nomads from the African Sahel. Pereira L, Cerný V, Cerezo M, Silva NM, Hájek M, Vasíková A, Kujanová M, Brdicka R, Salas A. Eur J Hum Genet. 2010 Aug;18(8):915-23. doi: 10.1038/ejhg.2010.21. Epub 2010 Mar 17. New technologies in the genetic approach to sudden cardiac death in the young. Brion M, Quintela I, Sobrino B, Torres M, Allegue C, Carracedo A. Forensic Sci Int. 2010. An X-chromosome pentaplex in two linkage groups: haplotype data in Alagoas and Rio de Janeiro populations from Brazil. Ferreira da Silva IH, Barbosa AG, Azevedo DA, Sánchez-Diz P, Gusmão L, Tavares CC, Carvalho EF, Ferreira da Silva LA. Forensic Sci Int Genet. 2010. Nilotes from Karamoja, Uganda: haplotype data defined by 17 Y-chromosome STRs. Gomes V, Alves C, Amorim A, Carracedo A, Sánchez-Diz P, Gusmão L. Forensic Sci Int Genet. 2010. Publication of population data for forensic purposes. Carracedo A, Butler JM, Gusmão L, Parson W, Roewer L, Schneider PM. Forensic Sci Int Genet. 2010. Y-chromosome lineages in native South American population. Blanco-Verea A, Jaime JC, Brión M, Carracedo A. Forensic Sci Int Genet. 2010. Susceptibility genetic variants associated with colorectal cancer risk correlate with cancer phenotype. Abulí A, Bessa X, González JR, Ruiz-Ponte C, Cáceres A, Muñoz J, Gonzalo V, Balaguer F, Fernández-Rozadilla C, González D, de Castro L, Clofent J, Bujanda L, Cubiella J, Reñé JM, Morillas JD, Lanas A, Rigau J, García AM, Latorre M, Saló J, Fernández Bañares F, Argüello L, Peña E, Vilella A, Riestra S, Carreño R, Paya A, Alenda C, Xicola RM, Doyle BJ, Jover R, Llor X, Carracedo A, Castells A, Castellví-Bel S, Andreu M; Gastrointestinal Oncology Group of the Spanish Gastroenterological Association. Gastroenterology. 2010 Sep;139(3):788-96, 796.e1-6. doi: 10.1053/j.gastro.2010.05.072. Epub 2010 Jun 2. The initial peopling of the Americas: a growing number of founding mitochondrial genomes from Beringia. Perego UA, Angerhofer N, Pala M, Olivieri A, Lancioni H, Kashani BH, Carossa V, Ekins JE, Gómez-Carballa A, Huber G, Zimmermann B, Corach D, Babudri N, Panara F, Myres NM, Parson W, Semino O, Salas A, Woodward SR, Achilli A, Torroni A. Genome Res. 2010 Sep;20(9):1174-9. doi: 10.1101/gr.109231.110. Epub 2010 Jun 29. Digging deeper into East African human Y chromosome lineages. Gomes V, Sánchez-Diz P, Amorim A, Carracedo A, Gusmão L. Hum Genet. 2010 Mar;127(5):603-13. doi: 10.1007/s00439-010-0808-5. Epub 2010 Mar 6. How to catch all those mutations–the report of the third Human Variome Project Meeting, UNESCO Paris, May 2010. Kohonen-Corish MR, Al-Aama JY, Auerbach AD, Axton M, Barash CI, Bernstein I, Béroud C, Burn J, Cunningham F, Cutting GR, den Dunnen JT, Greenblatt MS, Kaput J, Katz M, Lindblom A, Macrae F, Maglott D, Möslein G, Povey S, Ramesar R, Richards S, Seminara D, Sobrido MJ, Tavtigian S, Taylor G, Vihinen M, Winship I, Cotton RG; Human Variome Project Meeting. Hum Mutat. 2010 Dec;31(12):1374-81. doi: 10.1002/humu.21379. Practical guidelines addressing ethical issues pertaining to the curation of human locus-specific variation databases (LSDBs). Povey S, Al Aqeel AI, Cambon-Thomsen A, Dalgleish R, den Dunnen JT, Firth HV, Greenblatt MS, Barash CI, Parker M, Patrinos GP, Savige J, Sobrido MJ, Winship I, Cotton RG. Hum Mutat. 2010 Nov;31(11):1179-84. doi: 10.1002/humu.21339. Genetic profile characterization of 10 X-STRs in four populations of the southeastern region of Brazil. Martins JA, Costa JC, Paneto GG, Figueiredo RF, Gusmão L, Sánchez-Diz P, Carracedo A, Cicarelli RM. Int J Legal Med. 2010. Population stratification in Argentina strongly influences likelihood ratio estimates in paternity testing as revealed by a simulation-based approach. Toscanini U, Salas A, García-Magariños M, Gusmão L, Raimondi E. Int J Legal Med. 2010. Establishment of a Radiogenomics Consortium. West C, Rosenstein BS, Alsner J, Azria D, Barnett G, Begg A, Bentzen S, Burnet N, Chang-Claude J, Chuang E, Coles C, De Ruyck K, De Ruysscher D, Dunning A, Elliott R, Fachal L, Hall J, Haustermans K, Herskind C, Hoelscher T, Imai T, Iwakawa M, Jones D, Kulich C; EQUAL-ESTRO, Langendijk JH, O’Neils P, Ozsahin M, Parliament M, Polanski A, Rosenstein B, Seminara D, Symonds P, Talbot C, Thierens H, Vega A, West C, Yarnold J. Int J Radiat Oncol Biol Phys. 2010 Apr;76(5):1295-6. doi: 10.1016/j.ijrobp.2009.12.017. Gender-associated differences of perforin polymorphisms in the susceptibility to multiple sclerosis. Camiña-Tato M, Morcillo-Suárez C, Bustamante MF, Ortega I, Navarro A, Muntasell A, López-Botet M, Sánchez A, Carmona P, Julià E, Tortola MT, Audí L, Oksenberg JR, Martin R, Montalban X, Comabella M. J Immunol. 2010 Nov 1;185(9):5392-404. doi: 10.4049/jimmunol.1000102. Epub 2010 Oct 4. Genetic association of CASP8 polymorphisms with primary progressive multiple sclerosis. Camiña-Tato M, Fernández M, Morcillo-Suárez C, Navarro A, Julià E, Edo MC, Montalban X, Comabella M. J Neuroimmunol. 2010. Efficacy and safety of pallidal stimulation in primary dystonia: results of the Spanish multicentric study. Valldeoriola F, Regidor I, Mínguez-Castellanos A, Lezcano E, García-Ruiz P, Rojo A, Salvador A, Castro A, Grandas F, Kulisevsky J, Martí MJ, Martínez-Martín P, Relova L, Rumià J, Cámara A, Burguera JA, Linazasoro G, de Val JL, Obeso J, Rodríguez-Oroz MC, Tolosa E; Grupo ESpañol para el EStudio de la EStimulación PALidal en la DIStonía. [Members of “GESPALDIS”: C Magariños, R Figueiras, L Cabañes (H Ramón y Cajal, Madrid); F Escamilla-Sevilla, MJ Katati, JM Martin-Linares (H Universitario Virgen de las Nieves, Granada); G Bilbao, I Lambarri, JC Gómez, O Rodriguez, R Villoria (H de Cruces, Baracaldo); F Alonso, J Ayerbe, J Muñiz (Fundación Jiménez Díaz, Madrid); B Oliver, M Aguilar, D Badenes (H Mútua de Terrassa); P Roldán, F Talamantes (H Clínic, València); A Sésar, M Gelabert (H Clínico Universitario, Santiago de Compostela); L López, S Giménez-Roldán, F Garcia (H Gregorio Marañón, Madrid); A Gironell, J Molet, RB Pascual-Sedano, R Rodríguez (Hospital de la Santa Creu i Sant Pau, Barcelona)]. J Neurol Neurosur Ps. 2010 Jan;81(1):65-9. doi: 10.1136/jnnp.2009.174342. Epub 2009 Sep 10. Association study of 44 candidate genes with depressive and anxiety symptoms in post-partum women. Costas J, Gratacòs M, Escaramís G, Martín-Santos R, de Diego Y, Baca-García E, Canellas F, Estivill X, Guillamat R, Guitart M, Gutiérrez-Zotes A, García-Esteve L, Mayoral F, Moltó MD, Phillips C, Roca M, Carracedo A, Vilella E, Sanjuán J. J Psychiatr Res. 2010 Aug;44(11):717-24. doi: 10.1016/j.jpsychires.2009.12.012. Epub 2010 Jan 22. Isolated hypoglossal nerve palsy secondary to an atlantoccipital joint synovial cyst. Case report and literature review. Santin JM, Castro D, Prieto A, Arias M, Arcos A, Díaz L, Gelabert-González M. Neurocirugia (Astur). 2010. Genome-wide identification of hypoxia-inducible factor binding sites and target genes by a probabilistic model integrating transcription-profiling data and in silico binding site prediction. Ortiz-Barahona A, Villar D, Pescador N, Amigo J, del Peso L. Nucleic Acids Res. 2010 Apr;38(7):2332-45. doi: 10.1093/nar/gkp1205. Epub 2010 Jan 8. Beta-adrenergic receptors in cancer: therapeutic implications. Pérez-Sayáns M, Somoza-Martín JM, Barros-Angueira F, Diz PG, Gándara Rey JM, García-García A. Oncol Res. 2010. A Strong Genetic Association between the Tumor Necrosis Factor Locus and Proliferative Vitreoretinopathy: The Retina 4 Project. Rojas J, Fernandez I, Pastor JC, Garcia-Gutierrez MT, Sanabria MR, Brion M, Coco RM, Ruiz-Moreno JM, Garcia-Arumi J, Elizalde J, Ruiz-Miguel M, Gallardo JM, Corrales RM, Carracedo A. Ophthalmology. 2010 Dec;117(12):2417-2423.e1-2. doi: 10.1016/j.ophtha.2010.03.059. Epub 2010 Jul 21. RANK/RANKL/OPG role in distraction osteogenesis. Pérez-Sayáns M, Somoza-Martín JM, Barros-Angueira F, Rey JM, García-García A. Oral Surg Oral Med O. 2010. Pharmacogenetic analysis in neoadjuvant chemoradiation for rectal cancer: high incidence of somatic mutations and their relation with response. 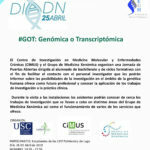 Balboa E, Duran G, Lamas MJ, Gomez-Caamaño A, Celeiro-Muñoz C, Lopez R, Carracedo A, Barros F. Pharmacogenomics. 2010 Jun;11(6):747-61. doi: 10.2217/pgs.10.51. A reduced number of mtSNPs saturates mitochondrial DNA haplotype diversity of worldwide population groups. Salas A, Amigo J. PLoS One. 2010 May 3;5(5):e10218. doi: 10.1371/journal.pone.0010218. Single nucleotide polymorphisms in the Wnt and BMP pathways and colorectal cancer risk in a Spanish cohort. Fernández-Rozadilla C, de Castro L, Clofent J, Brea-Fernández A, Bessa X, Abulí A, Andreu M, Jover R, Xicola R, Llor X, Castells A, Castellví-Bel S, Carracedo A, Ruiz-Ponte C; Gastrointestinal Oncology Group of the Spanish Gastroenterological Association. PLoS One. 2010 Sep 9;5(9). pii: e12673. doi: 10.1371/journal.pone.0012673. Testing the antagonistic pleiotropy model of schizophrenia susceptibility by analysis of DAOA, PPP1R1B, and APOL1 genes. Carrera N, Arrojo M, Paz E, Ramos-Ríos R, Agra S, Páramo M, Brenlla J, Costas J. Psychiatry Res. 2010. Mutagenesis of human neuropeptide Y/peptide YY receptor Y2 reveals additional differences to Y1 in interactions with highly conserved ligand positions. Akerberg H, Fällmar H, Sjödin P, Boukharta L, Gutiérrez-de-Terán H, Lundell I, Mohell N, Larhammar D. Regul Peptides. 2010. Disorders affecting the emotional sphere and impulse control in Parkinson’s disease. Fernández-Prieto M, Lens M, López-Real A, Puy A, Dias-Silva JJ, Sobrido MJ. Rev Neurol. 2010. Sequencing of Culex quinquefasciatus establishes a platform for mosquito comparative genomics. Arensburger P, Megy K, Waterhouse RM, Abrudan J, Amedeo P, Antelo B, Bartholomay L, Bidwell S, Caler E, Camara F, Campbell CL, Campbell KS, Casola C, Castro MT, Chandramouliswaran I, Chapman SB, Christley S, Costas J, Eisenstadt E, Feschotte C, Fraser-Liggett C, Guigo R, Haas B, Hammond M, Hansson BS, Hemingway J, Hill SR, Howarth C, Ignell R, Kennedy RC, Kodira CD, Lobo NF, Mao C, Mayhew G, Michel K, Mori A, Liu N, Naveira H, Nene V, Nguyen N, Pearson MD, Pritham EJ, Puiu D, Qi Y, Ranson H, Ribeiro JM, Roberston HM, Severson DW, Shumway M, Stanke M, Strausberg RL, Sun C, Sutton G, Tu ZJ, Tubio JM, Unger MF, Vanlandingham DL, Vilella AJ, White O, White JR, Wondji CS, Wortman J, Zdobnov EM, Birren B, Christensen BM, Collins FH, Cornel A, Dimopoulos G, Hannick LI, Higgs S, Lanzaro GC, Lawson D, Lee NH, Muskavitch MA, Raikhel AS, Atkinson PW. Science. 2010 Oct;330(6000):86-8. Catastrophes caused by neurologic diagnostic procedures. Arias Gómez M. Neurologia. Review. 2010 Oct;25 Suppl 1:61-7. doi: 10.1016/S0213-4853(10)70052-9.